You know how it works. We all make a plan. Sticking to it is the hard part. Sometimes we don’t really know how the plan is going to work until we have put at least part of it in place. Sometimes we realize that might not have been the best plan after all. What do we do then? We change before we move forward. Attending this rally would definitely be OUT for us! We wouldn't fit! Through the years we’ve had to change. We’ve had tent trailers, travel trailers, 5th wheels and even a couple of motorhomes. What we’ve had at the time worked for us then but definitely wouldn’t work for us now. We changed with the times and the seasons. Last year we had an absolute blast playing with a couple ATVs. We rode them in Arizona and in Utah. However, some states aren’t as ATV friendly as other states. This we discovered as we headed north for the next six months of the year and the toys sat most of the time. We also discovered that traveling with a 12’ trailer loaded with two large ATVs could be a pain. Not every park has long pull thru sites. Some places took a lot of creative maneuvering to put everything where it would fit. At times we even had to unload both ATVs and hand wheel the trailer at an angle into our site. Believe me that was not fun at all. In other places there was too much of us to fit at all. Hauling lots of toys can be a hassle but if you stay for a long time, can be fun. We had a brainstorm. We sold two of our three ATVs and bought one two-seater Polaris RZR. We knew this would be the answer …… but was it? We only have to offload one now instead of two. Actually, it really was a much better answer than the two ATVs. However, we still are pulling a 12’ trailer and have only used the RZR about 7 days in the last three months and this is high season usage time. Is the hassle really worth it? Is it time to really downsize instead of upsize? With so little usage it's hard to even consider a toy hauler for such a short period of use during the year. We’ve had a blast with the toys and certainly haven’t lost any money. Actually, we've made money when we sold the other two. -- thanks to our son. However, when we consider the months they sit along with the extra headaches associated with hauling a trailer, we’ve wondered if it was worth it. Maybe it is time to downsize and move on to something else. Maybe toys like this are better left for a time when we aren't so interested in moving down the road. Maybe these are better for snowbirds who settle in at one place or one park for three or four months at a time. Maybe this just isn't the season for these toys for us. What is our next plan? We don't really have one but know we need to make a choice. We could decide to stay put in one location for a few months at a time. Or, we could eliminate the need to haul a trailer. You saw that coming I bet. We really like the off road riding and we really like going places as we just haven't found a perfect forever winter destination. Sounds like we need a solution. Right? Our current vehicle is a 4WD but I’m not interested in ruining it by taking it off road. Those trails can certainly do a lot of damage to a vehicle. What would we do with it?? Keep it, of course, but leave it in Washington. Maybe the answer is to. replace the RZR (aka Jag) with a not-so-new Wrangler (aka new Jag). With that we wouldn’t have to worry too much about off road riding. Lots of RVers haul Wranglers. It definitely is food for thought. I can’t say it’s the plan but it’s food for thought and we’ll see how we feel as we think about it a little more. -- Exchange the RZR for something like this ?? We love the little RZR but it sure does hinder our travel. No plans -- everything is in chalk so we can easily erase it. For everything there is a season. A time for every purpose under the Heavens. That verse always runs through my head. It's always been a favorite. I'm also thinking that it fits us about now. 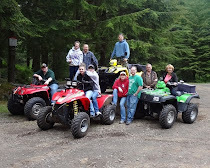 The season of the ATVs and UTVs may be past but boy have they been fun. Perhaps, it's time to move on to a new toy -- a new experience. Perhaps! Oh dear...my head is swimming with all the changes. I don't even pretend to know what to tell you to do but am very interested in seeing what you have up your sleeve. We have a 5th wheel and pick-up truck. When we change locations, I drive my Ford Escape pod separately. I can pave the way, check out campgrounds, and look for gas stations before Bob follows with Rigamarole. Then we also have a smaller run-about for sightseeing in locations with narrow tunnels, steep, winding roads and places we don't want to take the big truck. So far it has worked out well for us. Been there, done that with a 5th wheel, truck and extra car. We're still driving our "tow" separately because the motorhome is pulling the trailer. It's harder with a trailer though. You can't just back it into a site. That site is reserved for the motorhome. You know I can so relate to the hassles of hauling an extra thing be it trailer or boat. Hard to know what to do. Becoming snowbirds seemed to be the answer for us. Looking forward to hearing what you decide. We have the same problem, although we do put our Jeep on the trailer. I would like to get rid of the Ranger and the Jon boat and just pull the Jeep behind us. But Ed is not ready to give up his toys. Maybe in the future. When we use them it's fun, I just don't think we get to use them enough. I know you've talked about that before. You're right when we use them, it is fun. It's just that it's not enough. Simplify - our motto. However...if we had the money that might change. Can't wait to see how this dilemma "turns, turns, turns" out. If you do get a Jeep Wrangler, don't get a gray one or we won't be able to tell you apart from Al (from the Bayfield Bunch) as you wander the AZ desert. We are once again contemplating getting a tow vehicle...let us know what you might be getting rid of and we may need to talk. We are in Quartzsite beginning work tomorrow and will be looking to find a tow. Hopefully we can get together, let us know when you guys get to your spot in the desert. Things sure do change over time. We used to have 2 motorcycles and two snowmobiles. They were fun but there came a time when a change was due. Good luck to you in figuring out your timeline. I'm sure you'll make the decision that works for you. Is that a Motorhome hauling a helicopter !!?? I still say a nice BIG 5th wheel is in your future ! You'll have the truck for your driving around in. You'll have the 'garage' for the JAG plus lots of storage room. Heck, Bet you could even have a JAG and a HARLEY DAVIDSON in there. You're only driving one vehicle etc. etc. etc. The living space in some of those 5th wheels is gorgeous ! sounds like you have a few decisions to make!..we love our Jeep wrangler by the way! Lot's of interesting choices ahead. The good news is none of them seem life-threatening so no matter what you choose it'll work out for the better. We really like our old YJ Wrangler and is real simple to tow. It can go alot of places and is't modified. We plan on doing some trails while in Q.